Flood levels in Nakhon Si Thammarat are still critical while many areas of Surat Thani remain inundated. The water mass flowing downstream from Nakhon Si Thammarat to Surat Thani has increased water levels in several rivers in the latter province. 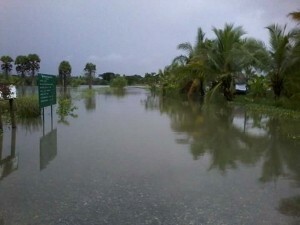 Tapi River has now flooded the embankments and nearby homes in Tha Kham and Tha Sa Thon sub-districts. Residents were forced to stay on the second floor of their houses while some had to take refuge on Asia Road 41 as the flood level is rising continuously. In Nakhon Si Thammarat, only around 450 homes in Chaloem Phrakiat, Chian Yai and Pak Panang districts are still suffering from waterlogging. Even though up to 100 million cubic meters of the flood water has been drained into the Gulf of Thailand through Pak Panang River, the runoffs from mountains in the province continued to flow to the river and flooded the embankments. It has been speculated that in five days the water levels will recede. Provincial authorities have already installed 35 water pumps and 22 water pushing machines in an effort to relieve the flood situation. Thirty-two more water pushing machines will later be obtained to speed up the draining process.